In our previous blog, “The Hunt for Value With High Earnings Expectations in Asia,” we discussed how a simple sequential earnings revision screen historically delivered positive return alpha over the value screen in the majority of markets. The value screen was constructed based on the average of three underlying factors: book value-to-price ratio, earnings-to-price ratio, and sales-to-price ratio. Since the Asian market is highly fragmented and the distribution of each underlying factor may be different, we examined the earnings revision screen overlay on each underlying factor for both value and quality in our new research paper, “Earnings Revision Overlay on Fundamental Factors in Asia.” For quality, the underlying factors are: accrual ratio, financial leverage ratio, and return on equity ratio. The earnings revision screen overlay on fundamental factors was done in two steps. First, we selected the top quartile of stocks by each fundamental factor from the base universe. Next, we dropped the bottom quintile of stocks by earnings revision from the stocks selected in the first step. We tested two earnings revision measures: the six-month change in the EPS estimate and the six-month diffusion of the EPS estimate. EPS diffusion was computed as the number of upward revisions minus the number of downward revisions of EPS estimates, divided by the total number of EPS estimates. Let’s take a closer look at some of the broad market highlights from the paper. Over the entire back-tested period from March 31, 2006, to March 31, 2018, the earnings revision-screened factor portfolios outperformed their respective comparable underlying factor portfolios across the majority of Pan Asian markets (see Exhibit 1). The earnings revision screen also lowered the risk of the fundamental factors significantly across the majority of markets over the same period. During down market periods, the earnings revision-screened factor portfolios outperformed their respective comparable underlying factor portfolios across the majority of markets. 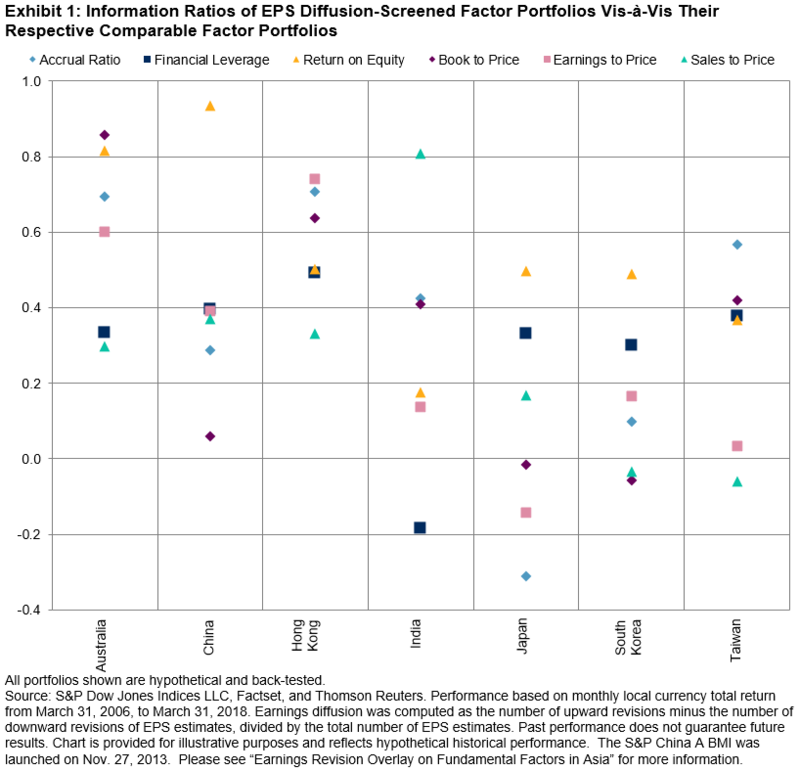 The earnings revision screen did not introduce a strong sector or size bias in the fundamental factor portfolios constructed from the respective broad market universe. Among various Asian markets, the earnings revision overlay generated the most significant excess return in Australia and Hong Kong for the majority of fundamental factors (see Exhibit 1). The results of our research suggest that the signals from earnings revisions are important even for fundamental factor strategies, since the earnings revision-screened factor portfolios reduced the risk and enhanced the return of the comparable factor portfolios, historically, across the majority of markets.